In West Midlands days it was refurbished by Anglo and adapted for use as a CU/BAT/ET. Reregistered KFH412D and was a traveller mobile home. Very rare, if not unique! The only other Traders I know being used for fire service applications were the Oxford ET, two Salvage Tenders for the London Salvage Corps and one pump - which was used by Ford at one of their factories. Traders did however see quite a lot of fire service use in Belgium, Denmark, the Netherlands, Australia and New Zealand, as well as some African countries. Added by Rob Johnson on 16 October 2018. Rob here are Trader pumps on this site used by the Royal Ordnance factories. See picture #6371 and picture #33508. Added by Petros on 18 October 2018. I was thinking about the actual Trader forward control versions with the distinctive front engine cover, or "snout", which was replaced by the custom cowl on both this ET and the LSC wagons, although the latter kept the front grille and headlights. 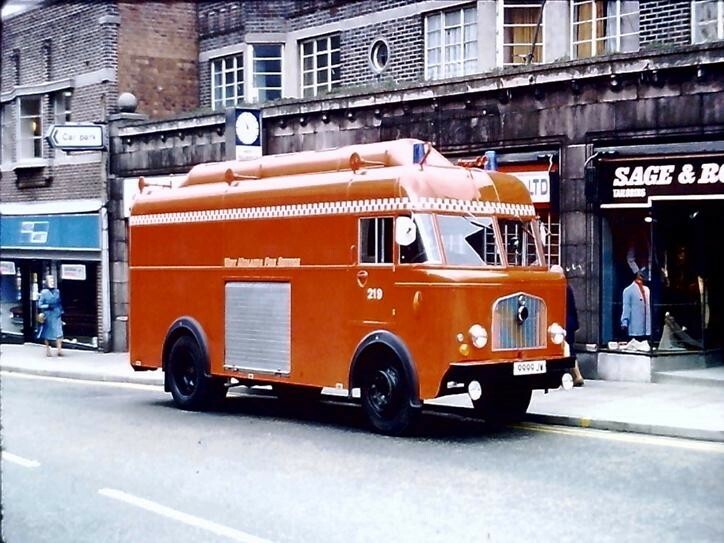 Quite a few of the earlier conventional cab Thames chassis like those in the shots you mentioned were exported for fire engine applications, but I don't know of any which were used by UK municipal or county brigades. But these were not actually Traders. This name applied only to the forward control chassis, which was introduced in 1957 and subsequently replaced by the D series in 1966. The conventional control K series from Ford of Germany was introduced into the UK market in 1962 and also then badged as a Trader. But these had quite different and considerably updated cab styling when compared to the old conventional cab British Thames. When I worked for Ford Truck SVO and sold the first D series to Gloucestershire, we had an uphill job because there were so few Ford products in service with UK fire brigades. Bedford and Commer pretty much owned the business, and it took a while to get D series sales moving. Eventually around thirty British brigades bought D series, and some like Lancashire bought large numbers. But the D dd much better with fire services in countries which already used large numbers of Traders, including Denmark, Belgium, the Netherlands, Australia and especially New Zealand. Added by Rob Johnson on 19 October 2018.